One of the many minor miracles achieved by Ryan Coogler’s Rocky follow-up Creed is the unexpected depth the movie lends to the events of Rocky IV, the thinnest and cheesiest entry in the saga so far. By chronicling the boxing aspirations of Adonis Creed (Michael B. Jordan), the heretofore unknown illegitimate son of Apollo Creed (Carl Weathers), the film gave Apollo’s Rocky IV death at the hands of Ivan Drago (Dolph Lundgren) real poignancy, forcing cartoony revenge fodder into the pull of real-world gravity. The new sequel, Creed II, doubles down on this strategy, aiming to stir up Rocky IV nostalgia while also recontextualizing that Cold War-era popcorn movie as a possible family tragedy. As an over-narrating sportscaster might say: It’s a risky strategy, now let’s see if it pays off. In the years since his heroic split-decision loss at the end of the first film, Adonis Creed has worked his way up to the heavyweight title by winning a series of fights that may not have presented him with major challenges (not unlike Rocky Balboa’s predicament in Rocky III). At least that’s what the mountainous Viktor Drago (Florian Munteanu) implies, flanked by his father, Ivan, when he turns up in the U.S. to challenge Creed to a new bout. The movie actually begins with the Drago family, first seen in a shabby apartment in the Ukraine as Ivan jabs his couch-sleeping son in the shoulder to wake him up for an early-morning training session. New director Steven Caple Jr. stages this brief pre-credits sequence without foregrounded dialogue, painting a minimalist portrait of faded glory. It’s also a marked contrast between the Rocky sequels of yore, which tended to begin with a boilerplate rehash of the previous film’s final scene. Creed II does resemble its franchise cousins in that there’s just plain less work to do here than in the introductory original, which necessitates stringing the story out with personal melodrama rather than more observational moments. 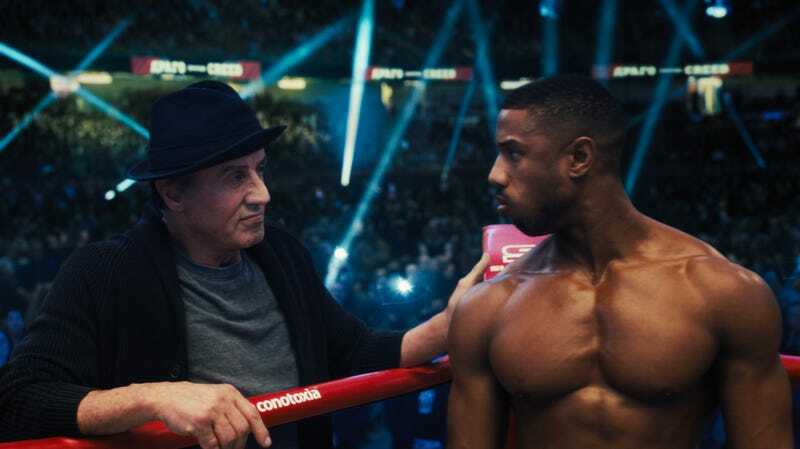 Creed agonizes over the challenge to the legacy he’s struggling to build, as Rocky (Sylvester Stallone, folksy and shuffling as ever) warns him against taking Drago’s menacing bait. There are new wrinkles in Creed’s relationship with his girlfriend, Bianca (Tessa Thompson), whose hearing loss is continuing apace, and Rocky has a family-related subplot in the background, too. None of this is quite as fresh as Creed, one of the best-crafted franchise extensions in recent memory. Caple maintains that film’s grounded approach, but he uses more traditional signifiers of grit: a handheld camera, with plenty of color-drained blue and gray compositions, and less of Coogler’s thrilling showmanship. Still, there are more arresting images than in the many Stallone-helmed installments, particularly with the following shots Caple seems to love, tracking his characters as they head toward the ring for a match or into the cold early-morning air for a run. Sometimes the movie feels torn between spare evocations of a boxer’s life and crowd-pleasing evocations of past movies. But more often than not, Caple splits the difference with aplomb. The obligatory pre-climax training sequence wouldn’t be out of place in a montage of Rocky montages, but its setting in the California desert (much of the movie takes place in Los Angeles, rather than Philadelphia) brings visual distinction, and while the Dragos make for familiar, glowering villains, their dynamic is far more human than anything Ivan did in his first Rocky appearance. Here, he berates his son and complains bitterly about all that their family lost following his defeat at the hands of Rocky. (Brigitte Nielsen appears, too, though in a near-wordless part.) It’s a borderline abusive relationship that turns the younger Drago into a sympathetic monster. He’s not, however, a fully fleshed-out character. A more ambitious movie might have evenly split between the Creed and Drago clans, or broken away from the train–fight–low point–train again–fight again structure. But Jordan and Thompson remain a potent combination of strength and vulnerability, worthy of the series’ humble origins. As for Stallone, there are still comfortable pleasures to be derived from how these later-period movies bring Rocky back to his working-class roots in his dotage, here assisted by a Sly co-writing credit. Thankfully, the movie has Stallone’s understanding of Rocky Balboa without his pervasively clumsy way with words (beyond the intentional, charming clumsiness of Rocky himself; his fumbling but confident small talk remains a wonder). The quiet, graceful moments are vastly preferable to the torrent of ridiculous expositional sportscasting narration that accompanies every fight scene, explaining and re-explaining the extremely familiar stakes ad nauseam. (It was a minor problem in the final bout of Creed that has spread to every fight scene of the sequel.) Ultimately, Creed II feels a little muffled by its workmanlike touches, especially when it gets in the ring. Just as Rocky was too low-key and charming to spawn a fully worthy successor for several decades, Creed so elevates its franchise roots that even a pretty good sequel can’t land with the same impact. Then again, a 2018 movie called Creed II expanding on Rocky IV to become one of the better Rocky movies may be another minor miracle on its own.